Metro Vancouver’s reservoirs have received a hearty helping of rain so far this week, boosting water levels to 60 per cent full. West Vancouver received a total of 124mm of rain in August, with the vast majority of that rain falling between August 28 and 31. The climate normals for the North Shore region averages around 50 to 60 mm of rain during the month of August, making last month greatly exceed expected precipitation levels. A total of 67.8mm of rain fell at Vancouver International Airport last month, with 58mm falling just in the last five days,. The normal level is marked at 36.7mm, meaning Vancouver received over 184 per cent of expected precipitation. The last week has been a stark contrast to the extremely warm and dry summer Vancouver has experienced so far. Until last weekend’s storm, Vancouver had only seen 41.6mm of rain since the beginning of June. As statistics go, the summer of 2015 won’t appear to be a seriously dry summer in the history books. Normal rainfall levels for June, July and August are 126.1mm and while Vancouver is still below that range, it’s total of 109.4mm for the period is not as dramatic as it would have been if last weekend’s storm had not hit. 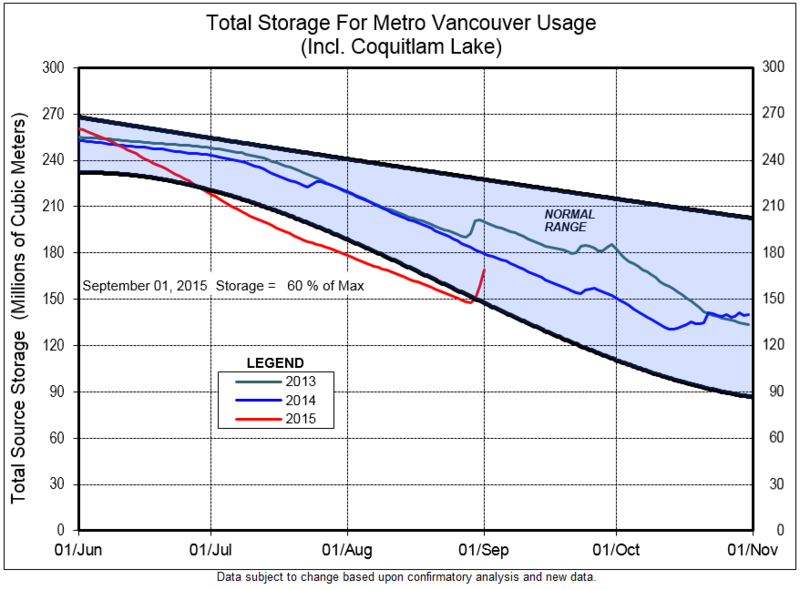 With rivers and streams now almost overflowing with water, the three reservoirs feeding Metro Vancouver’s water supply have filled up well within the normal range for this time of year, increasing from almost 50 per cent last week to 60 per cent as of September 1. There is no word from regional authorities when water restrictions may be lifted, but as of Wednesday afternoon Stage Three restrictions are still in effect.